Most of the time, when a pup spends a long time in the shelter, they don't really know what it is to call a place "home". So when a stranger adopts a dog from the shelter and takes it home, the furry friend isn't really sure what's happening. Sometimes they look confused, sometimes they look frightened - the reactions vary from pup to pup, but they all have one thing in common - they're just adorable. 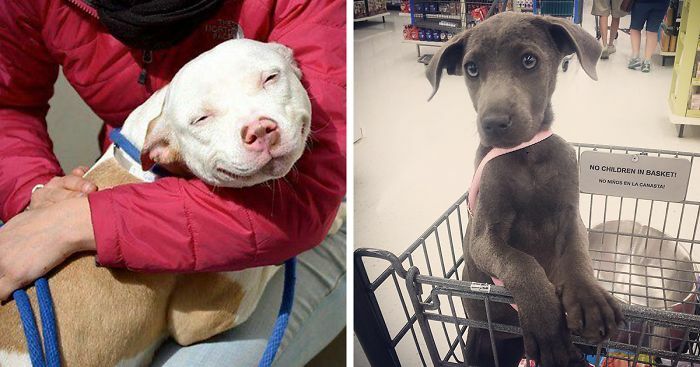 Keep on scrolling to take a look at Bored Panda's list of adorable newly adopted puppies and what they looked like when they entered their new home for the first time. Have any similar photos? Add them to the list! I'd smile like this too if I needed a forever home. PLEASE - Adopt a rescue dog, they need us. Aww I LOVE people who adopt older dogs, thank you! bless you for adopting a senior! This is the most beautiful dog i ever seen... Look at his eyes! It is wonderful how these dogs "know" they're finally going home! It's ok, the store manager gave us permission. Those markings are amazing! Beautiful! I'm going to live in a real home with a family who will love me happily ever after. What a joy it is to see one of the many suffering street dogs in Bulgaria find a loving home. This is so generous of you! Take good care of the little darling - it's not an easy life for a street dog here. We have three rescues at home and they bring us an incredible amount of joy! I would like to adopt BOTH of you!! He's so cute !!! Baby is adorable too. He looks like he can't quite believe it! So cute!! Like the sign on the bed, restful sleeper. How in the world did this puppy got in a shelter. Who dumped her? Why??? ???? My god that dog is cute!! It's very scary when dogs learn to drive. #47 Adopted This Cutie From The Shelter Today! #50 Today, We Adopted A 9-month Old Fluffy Friend. Meet Nook! #52 Congrats To Loki Of The Marvel Mutts On His Official Adoption Day! Is he a shiba!MY FAVORITE! Wow some pups are just comfortable right from the start as if they knew you were coming for them all along. Oh oh and oh what a cutie. #71 First Day Home And She's Made Herself Comfy! #76 Meeca In The Car On Her Way Home From The Shelter. awww so much cuteness in this pic ???? #80 Found This Little Guy Wandering Around On A Very Cold Winter's Day, Couldn't Just Leave Him To Freeze To Death So We Took Him Inside And Never Let Him Go!